Tonight's "haunted house" episode of Doctor Who has a lot going for it, including some genuinely creepy moments and a companion rescuing the Doctor in a way we've never seen before. But it also exposes how the show's over-reliance on romance as a storytelling engine is running into the law of diminishing returns. Spoilers! Towards the end of "Hide," the Doctor announces that this isn't a ghost story, after all — it's a love story. This is meant to be startling, except that it seems like every Doctor Who story is a love story these days, pretty much. It's like Jessica Fletcher announcing that the most famous guest star is the culprit in Murder She Wrote — not really a surprise. That said, "Hide" is a really neat take on a ghost story. Going back to 1972's "Day of the Daleks," the show has always treated ghost stories as an excuse to do something wacky with time displacement. But this one, in particular, reminded me of Sapphire and Steel at its spooky best. In Sapphire and Steel, the "ghosts" always represent the past or future breaking through and disrupting the present, due to the malicious nature of time. The time-displaced cannot be reasoned with, they can only be exorcised, just like other ghosts. The first half of "Hide" suggests that we're going to be dealing with something similar: some kind of monstrous apparition has poked through the walls in reality, from a weird past or future, and it has to be sent away. The Doctor and Clara stalk through the dark mansion, investigating cold spots and strange noises, and it's actually quite chilling. The use of 1970s ghost-hunting equipment, as part of the period setting, only adds to the crazy menace. And then in the second half, it turns out the "ghost" is actually a woman from the distant future, Hila, who was caught up in a time experiment and is actually trapped in a pocket universe, with a few minutes of collapse spread out over endless aeons. 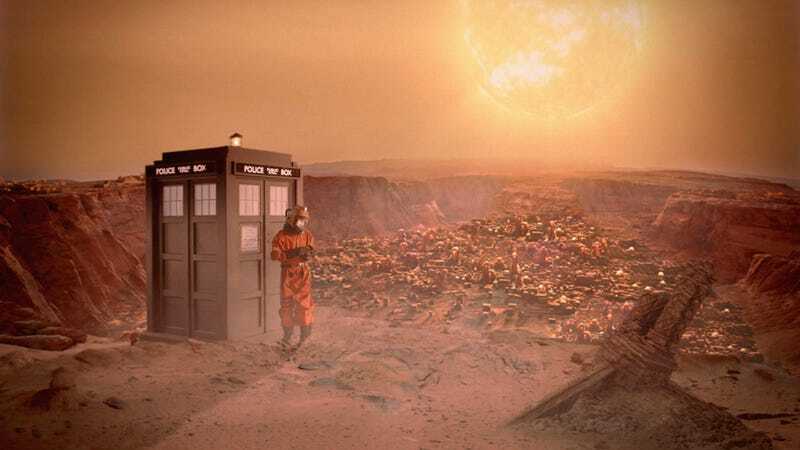 The Doctor discovers the truth by "going always," sampling the whole history of this one spot on Earth from the beginning of the world to the end — in a neat use of time travel that we haven't exactly seen before. The Doctor rescues Hila, but winds up trapped in the pocket universe himself — and then after he's rescued in turn, it transpires that the monster chasing Hila is also an innocent victim, also in need of rescue. This is one of those episodes where the guest cast really brings a lot — Dougray Scott and Jessica Raine are Alec Palmer and his psychic friend Emma Grayling. Emma's in love with Alec and thinks he's not interested. But as is often the case with the "cold man" romance narratives, Alec is actually suffering from severe PTSD as a result of the terrible things he did and saw in World War II, where he worked for British Intelligence. PTSD is commonly portrayed as a kind of haunting, in which something from the dead past that won't let you go. But in this case, it's Emma, who can communicate with actual ghosts, who's dragging Alec into the future and bringing him back to the land of the living, etc. Emma, meanwhile, has an interesting conundrum of her own: she's a powerful empath, but she can't tell if Alec reciprocates her feelings for him. Because when you're this close to a subject and feel this strongly, you can't always tell if you're picking up someone else's emotions or just projecting onto them. This episode already has a powerful/clever emotional arc, with Alec and Emma — and then it tries to pile a bunch of fruit baskets on top, like a Carmen Miranda hat. The monster turns out to have been separated from its companion monster, which is what causes the Doctor to announce that this is a love story. And then Hila is somehow determined to be the long-distant descendant of Alec and Emma, proving that those two are fated to get together and live in paradoxical bliss with their own great-great-great x1000 grand-daughter. It's as if having a clean, well-constructed relationship storyline was just too simple. And that's sort of what I mean, about Doctor Who running into the diminishing returns of romance as a plot engine. I couldn't help wondering if somewhere during the production of this story, someone felt as though just having one love story per episode wouldn't cut it — we've already done that a thousand times. We need to up the ante. Everybody gets a love story, even the monster! That said, this was mostly a crackerjack episode, and only starts to feel contrived in its final minutes. So count that as a win. Meanwhile, after no movement on the "Clara" mystery last week, we get some movement this time around. When she's blown away by seeing all of Earth's history, the Doctor tells Clara that she's "the only mystery worth solving" — which is a bit sad, because you'd hope that the Doctor would say that about any human being. (Tennant would have meant all humans by that statement, the same way as he told Wilf humans "look like giants to me." But not so much Smith's Doctor.) Smith's interested in Clara, not so much because all humans are fascinating, but because he's trying to unravel how she can have lived multiple lives — and of course, his Doctor is (supposedly) 200+ years older and more jaded than Tennant's was. In any case, the Doctor has a secret agenda in bringing Clara to this haunted house, in much the same way he did in bringing Amy to the Flesh uprising. The Doctor wants Emma the psychic to get a reading on Clara and figure out if there's something abnormal about her. But Emma says there's nothing unusual about Clara. And meanwhile, Clara's having some trouble with the TARDIS, which once again doesn't want to let her in when the Doctor's not around, and acts sort of hostile towards her. (The story builds quite a bit on "The Doctor's Wife" and its suggestions about the TARDIS' personality.) Later, when the Doctor is trapped in the pocket universe, the TARDIS refuses to help because its power would be drained in that space — and it taunts Clara by speaking to her via a hologram of herself, as if Clara loves herself more than anyone else. But then, Clara seems to reach an understanding with the TARDIS, and they join forces to rescue the Doctor. Which might be a turning point in their relationship. The term "romance" used to mean just an adventure story, rather than specifically a love story — and a grand adventure can often make the universe of a hero feel larger, and more expansive, than a love story can. Despite being the story of a time machine that's huge on the inside and can go anywhere in the universe, from beginning to end, Doctor Who starts to feel very small indeed when it relies on love stories to the point of monotony. True, 21st century television calls for more character-driven storytelling and more emphasis on relationships — but there are other types of relationships in the world. Just ask Wilf or the Brigadier, both of whom had rich, emotionally complex friendships with the Doctor. In any case, "Hide" does a great job of capturing the feel of a spooky ghost story, and of broadening that story out into the tale of an explorer trapped outside our universe. It even works quite well as a love story, until it starts piling on too many relationships in an effort to get past our love fatigue.